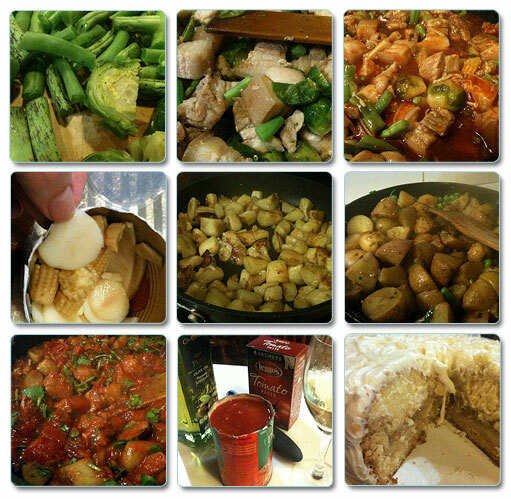 The collage above shows some of the things I’ve been cooking lately. The first four are from when I cooked Chinese Barbecue Chicken & Pork. I didn’t follow a recipe, as is typical for me most of the time. In this dish I used some pork rashers (spare ribs without the bone), broccoli, beans, chinese vegies and some chinese barbecue sauce. Very tasty! *The photo with me taking a water chestnut from the tin is because I like eating them straight from the tin (as well as the baby corn). Nom. I also nibble frozen peas, frozen chips and raw vegies while cooking. Yes, I can be strange. woo! The next four photos are from my cooking of a treat for my Husband’s Birthday. He requested Shadrani Fish from Consuming Passions (Book II) which has white fish fillets, eggplant and tomatoes with seasonings. To serve with it, I made a Potatoe & Pea curry. I did follow the recipe for the fish but the potatoe & pea curry was my own. The last photo is of the cake my darling Husbitect wanted; The Cherpumple! Unfortunately, I couldn’t find the same pies or cake mixes as used in the recipe. I baked an apple pie in a vanilla cake mix which turned out lovely. The only non-apple pie I could find was a berry crumble. I baked that in a butter cake mix. Crumbles don’t like to be Cherpumples. They go all gooey. Oh well, it’ll make a nice crumble on its own. I frosted the apple pie cake with vanilla frosting and it was all good. Yay for making tasty cakes! I will however, be attempting the Cherpumple again! I must make the whole thing. The video for The Cherpumple, by Charles Phoenix is a must see. Trust me, you will love this. I know! yummy! I just popped over from meet me at Mike’s.